I no longer worry about unleashing the green eyed monster. I am more than happy to release her chains and let her fly...well more heave-ho her out of the shed but do not let reality spoil our poetry. I decide a trip to Wales and the Ponderosa is a good way to get more acquainted with my new girl. We are getting along ok me and her. Once again she does not disappoint me. The Kawasaki Z250SL is proving a delight to ride. The gears are so slick, the braking is awesome and the handling is sublime. My face aches from grinning so much. My shoulder also aches a bit too. The slightly lower handlebars on the Kwak compared to my Keeway are taking some getting used to. I hope my body learns to adjust in time. The niggle makes me grateful I did not go for a full on sports model with even lower bars. Such a bike may have been my dream back when I was 17. My now much older bones beg to differ. We get delightfully lost. I only find being lost delightful when I am in Ren's company. Being lost on my own is terrifying and I loathe it. But getting lost with Ren is one of my favourite things in the world. We eventually discover we are lost in World's End. Could there be a more apt place to be lost in? 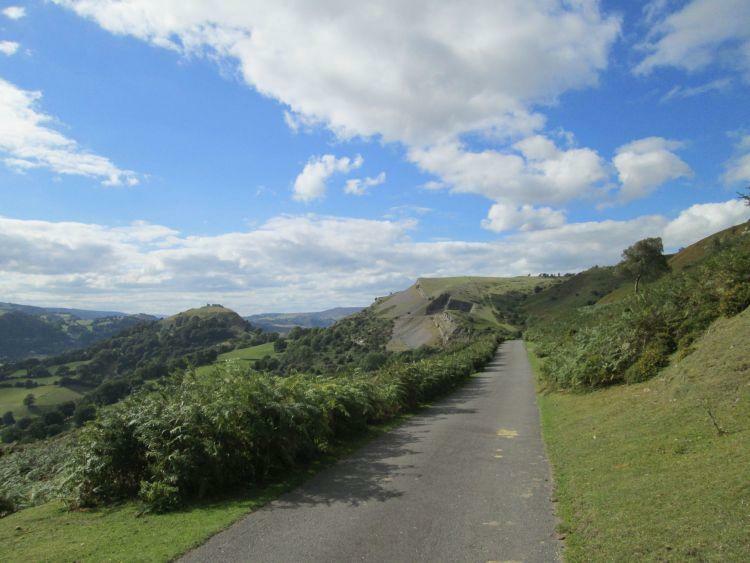 Worlds End consists of a single track road with scrumptious views. We go slow to avoid the sheep and soak in the scenery. This is delightful, this is a little bit of paradise this is...errrr...a bloody ford across the road! It is a slippery, slimy, algae encrusted water laden gateway to Hades. How very dare such a hellish scene appear in this little piece of heaven I was just dwelling in. Ok if I had been on my 125cc the sight of the ford ahead may have caused me a little concern. 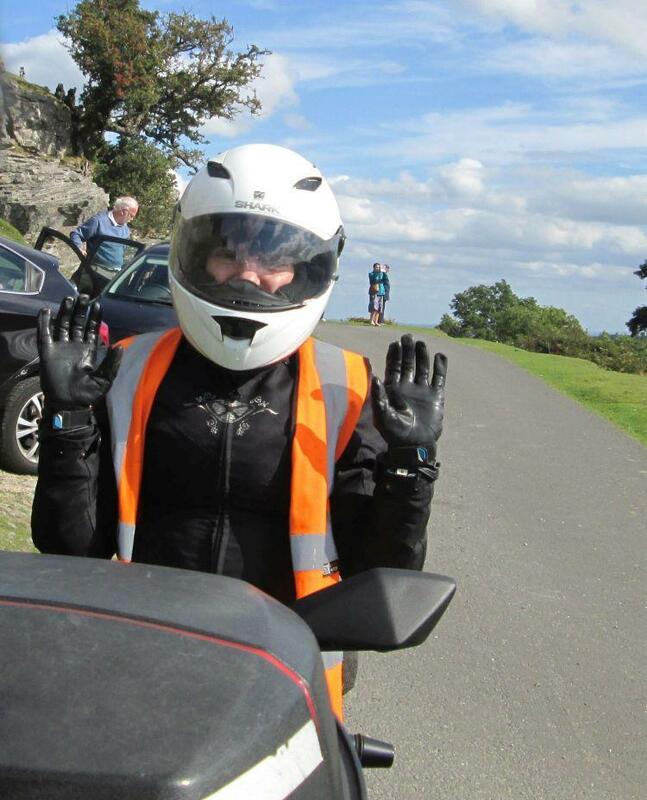 But on my 250cc I am well pretty damn scared. I do not think the Kawasaki is any less stable than the Keeway. In face due to its wider tyres and heavier weight it feels much more stable. What my problem here is the weight and more importantly the height of the 250cc. With the 125cc if I needed to put a foot down if I slipped and slithered across the ford the chances are I could have kept the bike up. With the 250cc the chances are I may drop the bike. The thought of smashing the faring makes me wince. It is a new shiny bike, I really do not want to bin it in a stream. I don't want to know how much it will cost to replace a fairing, or a light, or a mirror or a footpeg. Ok what to do? Do I get off and get Ren to ride the bike across for me. No I will never learn what I can and can't do on this bike that way but hell I need some big breaths here. I do admit to Ren I am scared so in true gentlemanly fashion he says he will walk alongside the bike to catch me if need be. Right ok good so here goes. I ride slowly to the water's edge. the water laps the front tyre. .. I twist the throttle and accelerate. Ren looks a little dumbfounded. He has been left behind in my haste to reach the other side, so much for walking with me, he did not get a chance. Ren thinks I was faking being scared. He says I rode like a pro through the water. Feet up, power on, scared me paah. Well let me tell you dear reader do not always believe what you see. To the unknowing eye my acceleration through the water and my feet up on the pegs may well have appeared to be the demeanour of a slightly cocky and confident skilled rider. However the truth was I was so terrified I had to get the whole thing over as quickly as possible. Hence when I am scared I go faster. I do not bother to put my feet out because I know they have not get a chance in hell of saving me being this bloody short so why bother? FEAR to me = Faster Engine And Revs. Once on the other side it is time to laugh once more and recommence our ride. An awkward junction with a bad camber gets my heart rate up. I am not sure I could have got my foot down if I had to stop. I slow right down and pray for no traffic as I near the junction. Fortunately luck is on my side and I get away without the need to stop. Even the sun shines today on the crazed and fearful. More miles, more smiles and more things I learn I can do on my new bike. Once again I started the trip In a deluge of rain. But the sun eventually came out and I had a glorious weekend of riding. 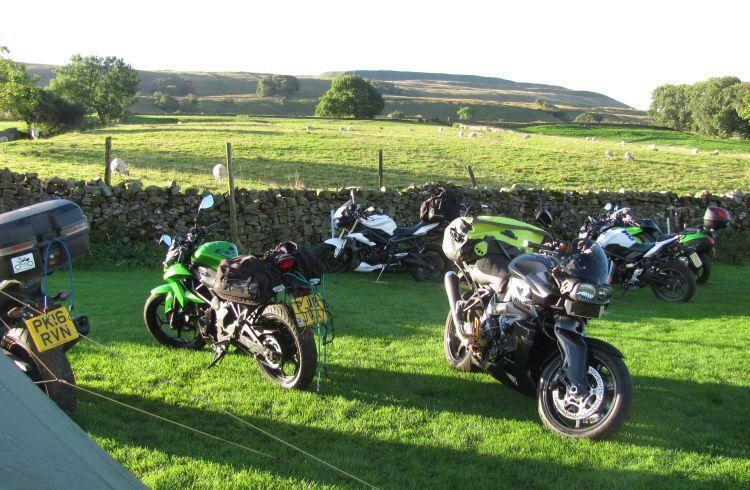 So if you get a flock of sheep what do you call a group of bikes?? How about a pride of motorcycles because after all we are so proud of are individual bikes. The miles are adding up and as is always the way with me I needed those miles to build my confidence. I am happy to say that the confidence is definitely on the up. I am finally getting faster on the bike and keeping up much better with Ren. I am learning what the bike can do. I can trust it more in the bends now and how well it can accelerate. I can use that acceleration and speed to have the confidence to overtake both on A roads and the on the motorways. That is a fabulous feeling that sudden spurt of speed when you need it. I totally love it. Barrrpppppp. For a little 250cc this bike really can go when you ask it to. It can get up to very errr impressive speeds on the motorways with no trouble at all. The only problem came when we came to a dead end down a lovely farm track. Where on my 125 I would have easily just turned it around I found myself in a bit of a pickle. The surface was sandy and loose so not much purchase for my the balls of my feet. I did eventually with Ren standing next me in case of mishap turn it around but it was hard work and it bit scary. Even though I had turned it around I felt a bit dis-heartened about how much stress and effort it took. However Ren quite rightly reminded me how hard I found turning my 125 around at first. The 250 will never be as easy as the 125 to maneuveer due to the extra height and weight. But hopefully in time it will get easier.. After all it took me nearly 2 hours to get into my garden and shed when I first brought the Kawasaki home, a job that now take 10 minutes. I wasn't sure when I got this bike if I had made the right choice. It was a lot of money to splash out. Yes I still have to pay for it each month which is a pain but I am really beginning to love it so it is worth it. I am still not as confident on it as I am on my 125cc but the Keeway has over 20,000 miles more miles practice on it. The main concerns being as I just stated my inability to flat foot and therefore to not feel confident on bad cambers and the lack of ability to able to manoeuvre it easily. But it does feel more planted than the Keeway and more stable on the road. It's cornering and braking are both superior as is of course its speed and torque. I still love going out on my 125cc, it has its own unique character and will always be my choice for an off-road gravel dirt track. 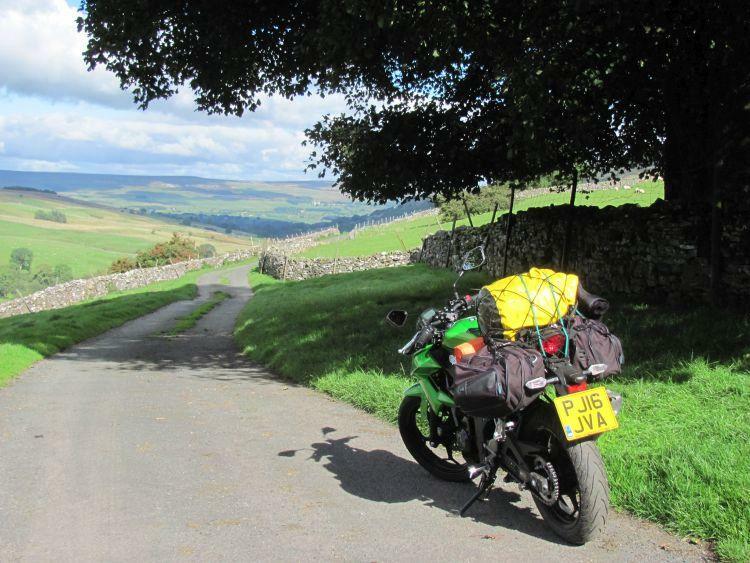 However I find the Kawasaki is becoming my bike of choice for day trips to Wales and the Lakes etc. mainly because of its ability to happily sit on the motorways and therefore get to where I want to go more quickly. But also because of how it handles on hills and bends, But see a dirt track or a slippery ford...then I want to morph back onto my 125cc.